Every year I make my daughters a handmade ornament and most years they make me one as well. There is something so special about ornaments that are made by hand. As you can imagine, our Christmas tree doesn’t look like one you would find in a department store. Nope, most of the decorations were made by someone with love. This year I thought it might be fun to make some ornaments with my daughters. 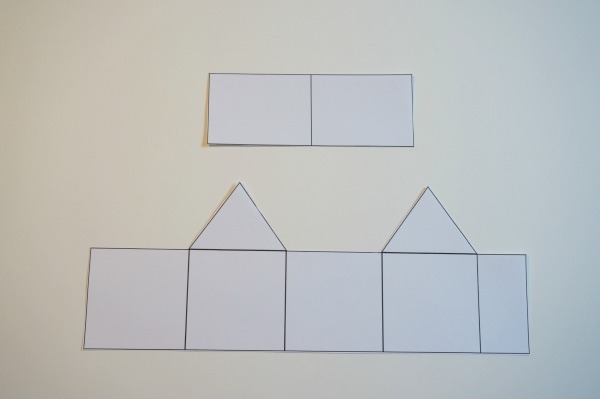 So, I created a paper house template. 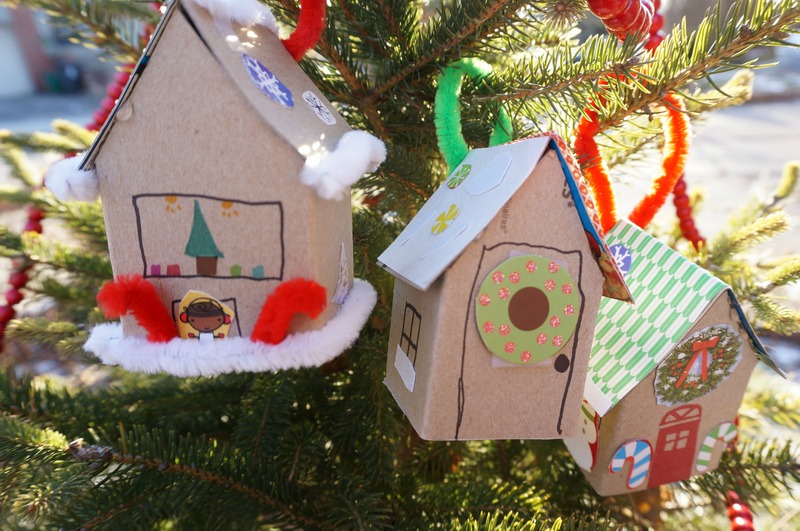 These paper house ornaments are a fantastic way to make use of old Christmas cards and other recyclables. 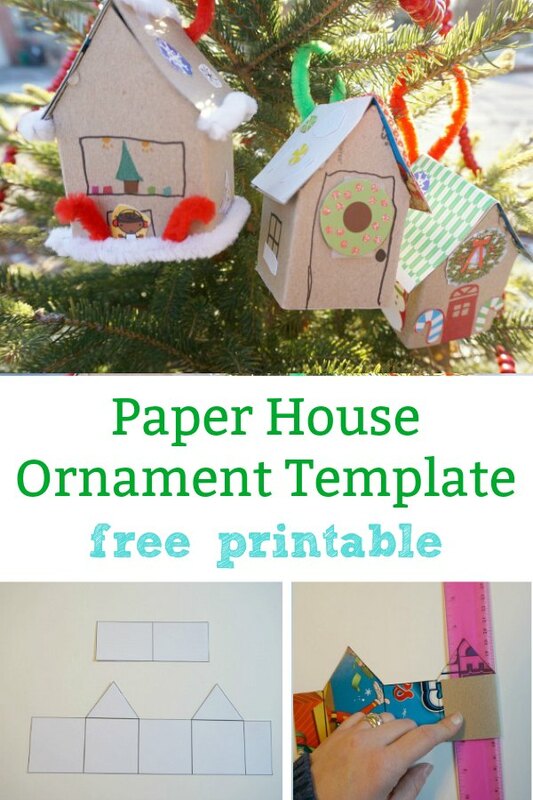 Print and cut out the paper house template on paper or card stock. 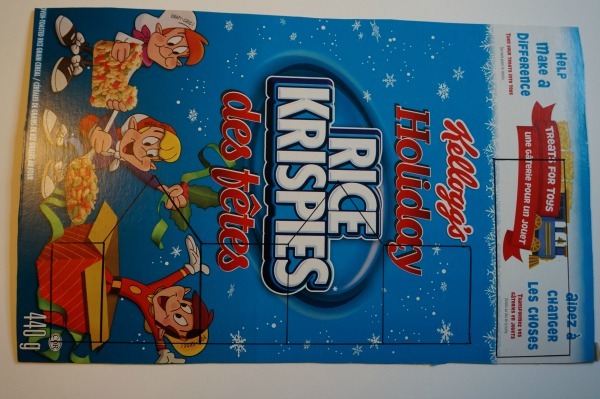 Trace the template onto the outside of a cereal box. I made 3 houses out of 1 Rice Krispies box. 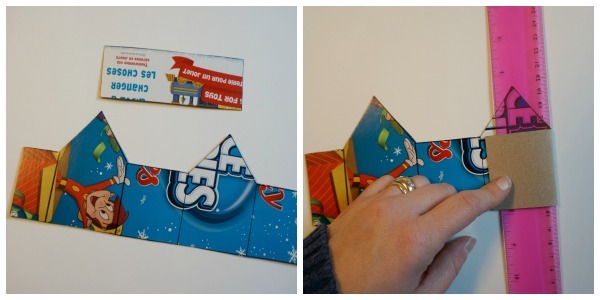 Cut out and fold the house along the lines. To make folding cardboard easier, place a ruler on the line you want to fold, then press down the fold along the ruler’s edge. This will keep your lines straight and clean. Use the glue gun to secure the tab end of the house. Run a bead of glue along the top of the walls and secure the roof to the building. Once the house is built, it’s time to have fun decorating. 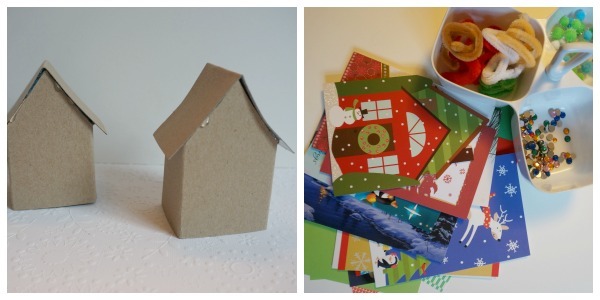 Cut out different details from old Christmas cards and use a glue stick to adhere them to the house. 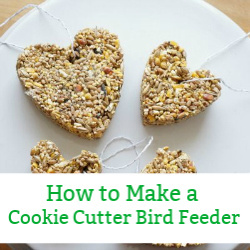 Use whatever other craft supplies you like. My kids used stickers, pom poms and pipe cleaners. When all the decorating is done, use the glue gun to adhere a piece of ribbon or pipe cleaner to the back wall of the house and hang your ornament on the tree. My daughters had a lot of fun making their little houses. I love how they both took entirely different approaches to decorating the house. I even took a turn creating my own little house. If you wanted to make larger houses, simply increase the template on a photocopier. I really love how small and sweet these houses are. 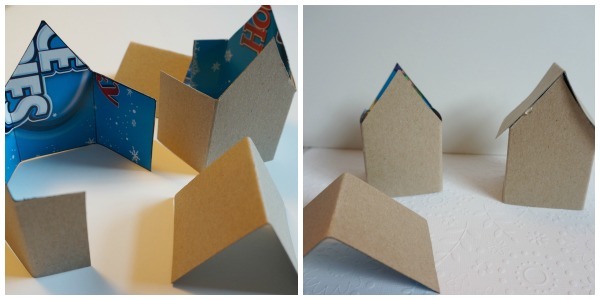 Skip the ribbon hanger and make a lovely little paper house village to decorate your mantle or holiday table. There are so many fun ways to use these houses. How will your kids decorate their paper house? 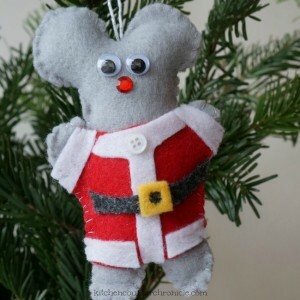 Today’s post is part of the fabulous 20 Days of Kid-Made Ornaments that is taking place all across the blogosphere. Along with my post, today you will also find a great kid-made ornament over on Nothing if Not Intentional and Me and Marie Learning. Please swing over to the Kid-Made Christmas: Ornaments’ Pinterest board, where you will find a great collection of inspiring ideas. 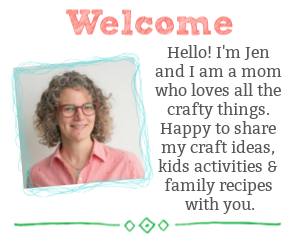 Or, if you have a kid-made ornament post that you would like to share, please link up over at Mama Miss’s 20 Days of Kid-Made Ornaments linky party. 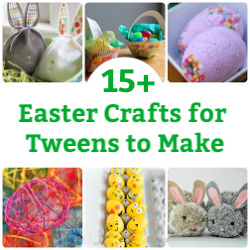 So many crafty ideas for you and your children to try. 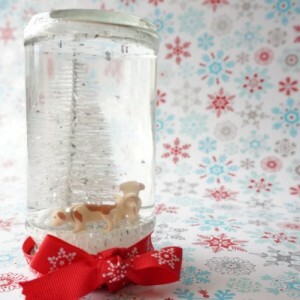 They look awesome and what a lovely idea, totally doing this one! The tutorial is great – what a neat idea! Thanks for sharing at After School.